But no one likes writing mushy valentines to everyone they know, right? So what's the solution? Make cupcakes instead! Even without words, they say Happy Valentine's Day to someone you care about and can be as romantic OR platonic as you want them to be. 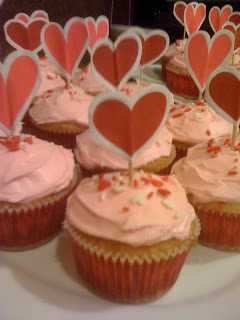 For these cupcakes I bought the mix, wrappers and heart toothpicks from Target, and just... put them together. Ta da! ZERO creativity required. If you have more time on your hands and want to get fancy you can always (1) make frosting and cake from scratch, and/or (2) buy some toothpicks and design your own paper toppers based on whatever special occasion you need the cupcakes for!